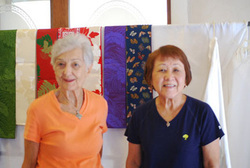 The Diocesan Altar Guild consists of women from a variety of churches on O‘ahu who meet together each Tuesday to make church linens and stoles for clergy. These items are available for sale to the churches and members of the Diocese. The Diocesan Altar Guild holds an exhibit of their products each year at the Annual Meeting of the diocesan Convention. To contact the Altar Guild, please send an e-mail to the Executive Assistant to the Bishop who will forward on your contact information.